Although the aisles were full of technology and every kind of product, service and consultancy imaginable at the recent Annual Meeting & Expo of LeadingAge, an association of non-profit providers of aging services, a number of mostly low-tech, high-touch products were standouts when it comes to comforting and calming. 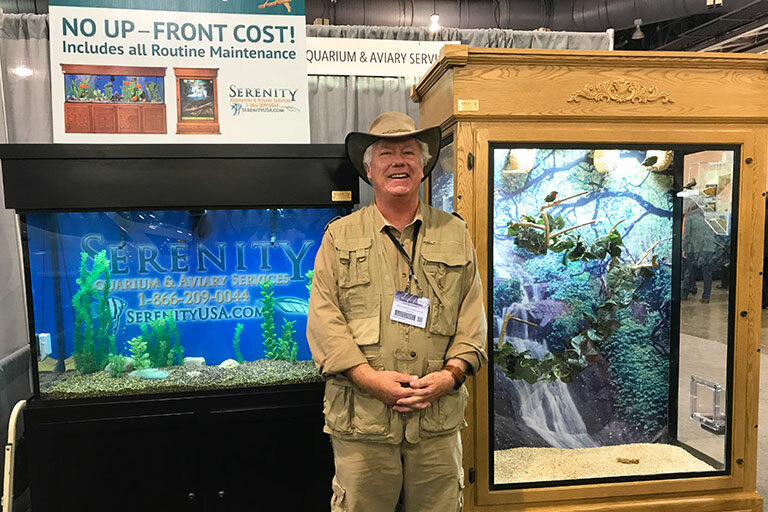 Dave Schneider, account executive with Serenity Aquarium & Aviary Services, was a standout himself, manning the Serenity booth dressed in a khaki safari-type outfit. While Serenity provides and services aquariums and aviaries in the upper Midwest, most often as monthly rentals in many kinds of businesses and offices, including high-stress areas such as surgical clinics, senior/assisted living/memory care communities have become his favorite. Known as Critter Dave from his days as a scout leader, pet store owner and co-host on a variety show with animals, Schneider’s still doing presentations with school children but especially loves the opportunity to talk with residents, staff and families about the fish in the aquariums and birds in the aviaries. Tom Canterino, co-founder and vp of Ageless Innovation/Joy for All Companion Pets, tells similar stories about those with dementia who become like “new people,” re-engaged and responsive in communication, holding regular, coherent conversations with staff and visiting family members after being given one of the company’s products. The Companion Cats, Dogs and new Kitten are designed to feel and sound like real animals with built-in sensors that respond to motion and touch, moving, meowing, purring and barking. 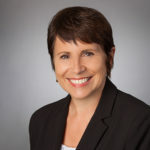 Canterino is among the core group that led the innovation, incubation, launch, and growth of the Joy for All business inside of Hasbro and earlier this year purchased 100 percent of the Joy for All business from Hasbro. 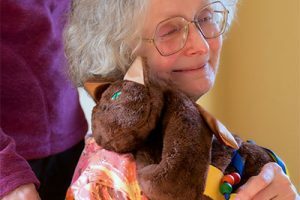 Twiddle Founder Margaret Light in 1997 created a prototype activity/comfort aid for her beloved grandmother Lily, who was losing her eyesight. No longer able to knit, do embroidery, cook or garden, Lily’s hands became idle and chilled. Light’s friends—seeing the difference it made for Lily—thought it might help loved ones with dementia, and a business was born. 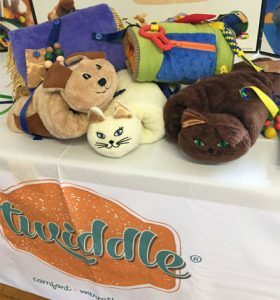 Today, Twiddle—a therapeutic memory support and rehab aid reminiscent of old-fashioned hand mufflers—is being used across the diverse spectrum of care communities for sensory disorders including dementia and Alzheimer’s. Providing warmth for cold hands and security when feeling vulnerable, Twiddles are designed to keep hands and minds active and engaged, or soothed and calmed. 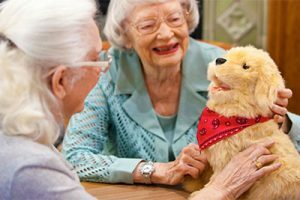 They can help and comfort those with diminished hand mobility, limited social interaction, or anyone soothed by repetitive tactile stimulation. Each Twiddle is made from a cozy fabric, and attachments are designed to increase flexibility and mental stimulation for daily living activities. Tethered within the product is a soft-plastic orbit ball. Attached to the outside are three detachable gadgets including a sealed satin or buckskin crackle pouch, a strand of textured ribbons and a loop of colorful beads. 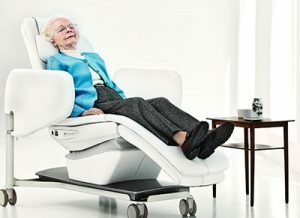 Another calming sensory experience, the Wellness Nordic Relax Chair made by Arjo helps people with dementia relax through soothing music and tactile stimulation, which can have a beneficial effect on their behavior and quality of life. Clinical Consultant Judy Burgess, RN, BSN, WOCN, related similar stories of those with dementia who were able to speak following sessions in the chair after periods of being unable to converse. Pre-set rocking programs combine smooth, quiet motion and soothing music with tactile stimulation to promote physical and mental relaxation, and refreshment, depending on the needs of the resident. A weighted blanket adds to the experience by creating additional comfort and sensory stimulation. Residents may find that the even, overall pressure from the heavy blanket, combined with the comfort of the U-shaped cushion, provides a sense of security, much like the feeling of a warm hug. 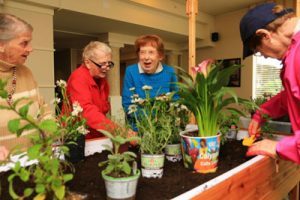 Eldergrow engages residents physically, emotionally, socially and spiritually through the transformative magic of indoor therapeutic gardening. The benefits of horticultural therapy include stimulating all five senses; improving motor skills, self-esteem and sleep; reducing dementia risk factors by 36 percent; reducing agitation in those living with dementia; and purifying the air, calming the mind and elevating the mood.